The clip lamp is flexible enough to be adjusted and storing enough to stay in place and easy to set the perfect lighting direction and viewing for your need. 5 Lighting Color Modes & 5 Brightness Levels Dimmable: 5 lighting color modes to choose. Each color mode has 5 brightness levels. Meet all your needs in different light environment. A Switch on The Cord: Simple power button to turn on or turn off light. Press quickly color modes button to choose 5 color modes, when hold pressed for 2 seconds, the light is automatically. "up" and "down" buttons to adjust light brightness to your preference reading brightness level. 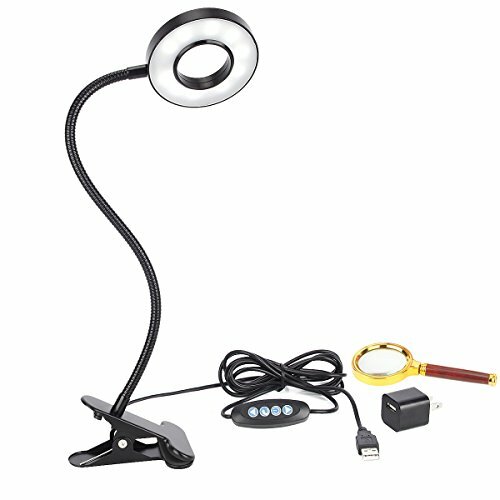 Flexible and Adjustable Metal Gooseneck: The clip on light is flexible enough to be adjusted, yet strong enough to stay in place and easy to set the perfect lighting direction and viewing for your need. Multi-functional Clip: Sturdy with large clip, allows for easy attachment anywhere and move around, lamp holds securely to shelf. Max clip open width: 2.36". If you have any questions about this product by Kernorv, contact us by completing and submitting the form below. If you are looking for a specif part number, please include it with your message.